Halloween and Fall are such fun times of the year for us. 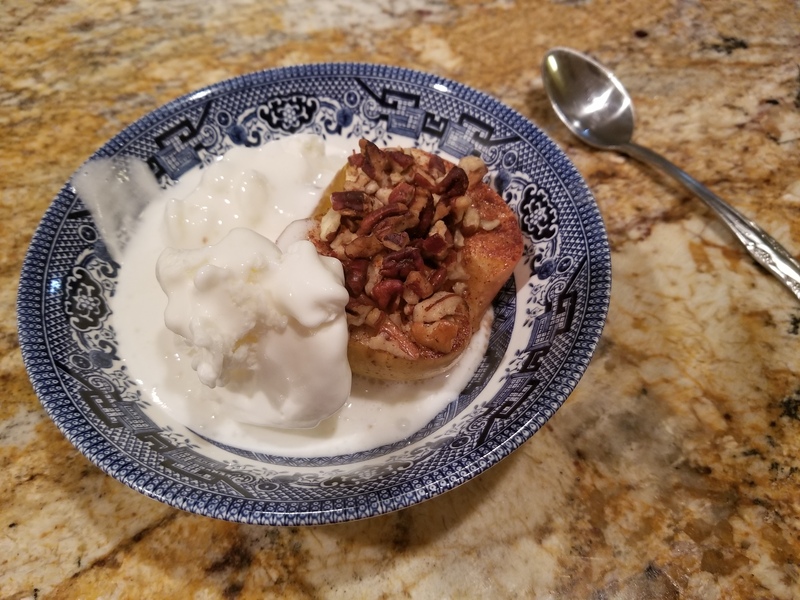 I love to get in the kitchen and bake this time of year. One of my favorite things to make for the kids is homemade bread. I know, it seems like an innocuous choice, but is there anything about me that has been plain yet? Nope, not my style. 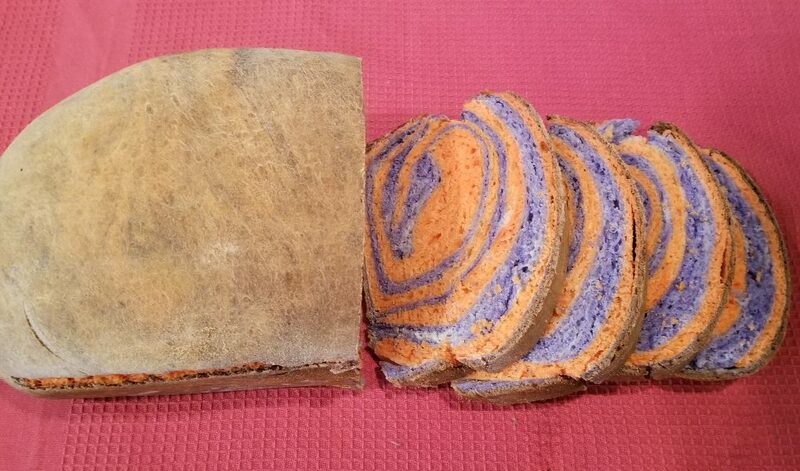 Lunches this week got an upgrade with some purple and orange Halloween bread for Tiny’s lunchbox! The house smelled so so good after they started baking! I usually make two loaves and freeze one. Since the bread does not have any preservatives in it, it will only keep, tightly wrapped, for about 4 days before it becomes an awfully lovely science project. Tiny loves to have bread color coded to the seasons for her lunches. My favorite is rainbow bread, where I make the bread in batches of six loaves at a time – yep, six whole loaves! Each batch of bread will make two loaves, so I mix three batches and color each one a different color of the rainbow so that there are six very lovely colors swirling around each slice. They are so pretty and festive! People always think that bread is tremendously complex to bake, but it is really just a matter of chemistry. Approach it from the science side of the baking and you are going to rock your bread! 9 cups of self rising flour (I like to use King Arthur Bread Flower – yes, it makes a difference) possibly 1 more for dusting and rolling. First you need to get your yeast to activate and start yeasting around. Warm ¾ cup of water (don’t over heat – just nice and warm) add your yeast and sugar to the cup and put it in a warm, draft free place to grow for about 5 minutes. You will know it is ready because it will bubble up and look like a coke float on top. Place three cups of flour in your stand mixer and add yeast, salt, half of your milk and half of your room temperature butter. Be sure you have your dough hook rather than your paddle or whisk attachment in place. Begin to mix on low and gradually increase the speed. Add the remaining flour slowly, alternating with your milk until you have a dough that pulls away from the sides, is a bit tacky, and isn’t full on sticky. Knead for another 5 minutes or so. If you decide to stop here and not add colors, you can skip to the rising section. If you decide to add color (because who doesn’t want to add color?!?! ), I prefer gel food colors that you get at your local craft store. I particularly like Wilton – it is a quality brand with no odd flavor in the red or black, which you can sometimes get. Divide your bread dough into two equal sections. We are going to color our layers from lightest to darkest. Pop your dough ball into your stand mixer and turn it on medium. I selected violet, red and yellow gels. I didn’t have an orange in my multi color box. I use the handle end of a spoon to scoop out my gel – for this bread, I want the colors vibrant, so I use a lot. For a bright orange, I use two parts red to one part yellow. This gives me that lovely pumpkin shade that I love this time of year. The violet (my daughter used to call it violent when she was small – cute, right?) goes in next – because it is darker, don’t worry about the color bleed and just go for it. This is why we color from light to dark. The dough will have little stripes where the color wasn’t fully incorporated when you knead it for about two minutes. Finish mixing the color in by kneading it by hand on a floured counter top. Keep in mind that the more flour you use the dryer it will make the bread – use sparingly if you have to use it at all. Place each color in a lightly oiled bowl and cover tightly with plastic wrap. Place in a warmish, draft free place and let it rise for about an hour, until it doubles in size. Take out your dough and divide each color into four equal sections. Roll out each ball into a rectangle that is roughly the same size for all four layers. Stack each layer on top of the previous, alternating colors. Adhere the layers to each other by wetting the top of the previous layer before you place the next one on top – press together to join. Once you have all four layers together, start at one short end and begin to roll the dough into a log. Place this into a well greased loaf pan, cover with cling wrap and let it double in size (proof) in the oven (not turned on) again for about an hour or until doubled in size. Brush the tops with the remaining butter, melted. Bake at 400 degrees for approximately 30 minutes. Mine takes just a bit longer. I have found that taking out the top oven rack and baking on the bottom one helps keep the top soft. If you want to avoid over browning, place a tented piece of aluminum foil over the tops of the bread after about 15 minutes of baking. The internal temperature of the bread should be around 185 to 195 when it is cooked all the way through (for those of you who are like me and use your kitchen as a science lab!). You can see the color peeking through! Remove from the oven and cool before serving. Don’t kid yourself though, you have to have ONE slice while it is still warm! Sandwiches have never been so much fun! 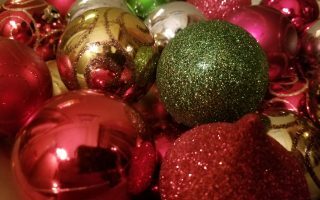 What do you do to make your kids feel special during a holiday? This would be so fun to do with the kids! They would love it! Mine love to take their school lunches on Halloween, Christmas or Rainbow bread. They are so funny.